An art exhibition by 7 students and their mentor, artist Suresh. It is their expression of emotions and gratitude towards beauty through colors and forms. These students are new to this art form and guided to explore their creative abilities in depth to bring out their phenomenal art pieces within a short period. One has to be here to witness the authentic, marvelous art works of fresh minds and some of the paintings by artist Suresh who is in tune with art and art education for over 16 years. Venue – Atta galatta- Book store event hall, koramangala, Bangalore Date – 29 & 30 March 2014 – 10 am to 7 pm Inauguration by : Mr. Subodh Shankar, Founder Atta Galatta, Dr. Mohanrao B panchal Asst, Prof. Kannada University, Hampi. Children Art exhibitions conducted every year to showcase the talents of kenfortes art students and to motivate new beginners. 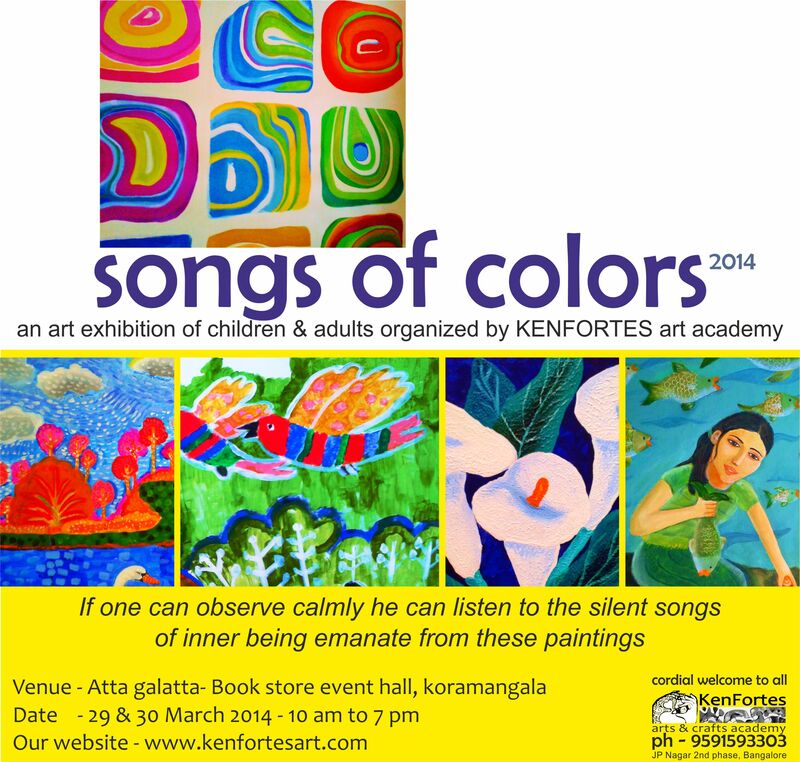 click to view earlier art exhibition works and paintings of children art exhibitions organized by Kenfortes art school earlier.